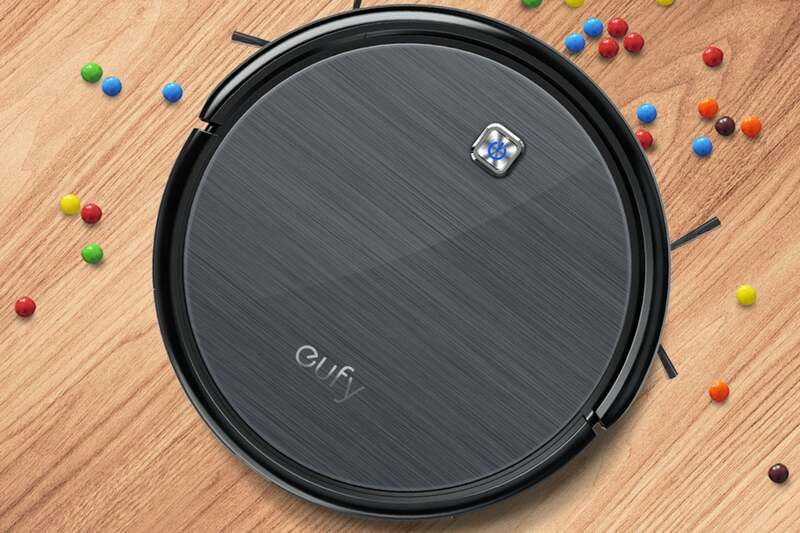 This robot vacuum will clean your floors as well as some premium models, at a fraction of the price. With their budget-busting prices, robot vacuums are a convenience many of us can’t afford. That makes the Eufy RobotVac 11 a welcome addition to the brigade. You won’t get premium features such as Wi-Fi connectivity, mapping, or camera navigation with this $250 vacuum, but you will get cleaning power comparable to premium models, at a fraction of the cost. There’s nothing flashy about the RobotVac 11. Its charcoal finish is adorned with nothing more than an Auto button and the Eufy logo on its tempered-glass top. Its front bumper houses the 11 infrared sensors that help it navigate, and an ample-sized dustbin takes up the bulk of its backside. Measuring 13 inches wide by 3 inches high, it has one of the flattest profiles of the robot vacuums we tested, making it ideal for safely getting in and out from under low-clearance couches and other furniture. At about 6 pounds, it’s also the lightest. 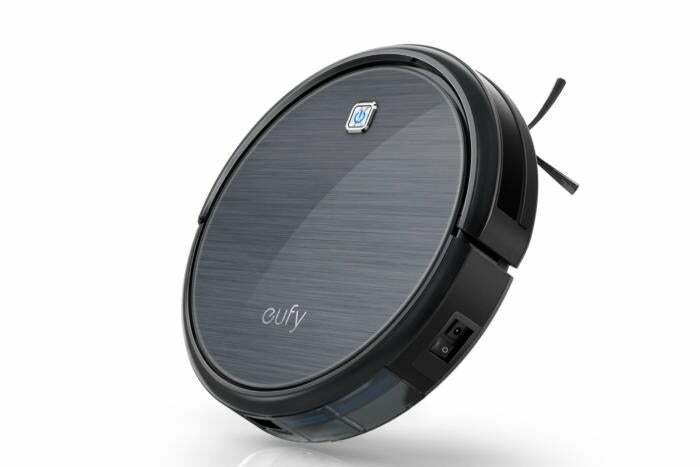 The Eufy RobotVac 11 lacks advanced features like Wi-Fi and mapping, but it cleans as well as higher priced robot vacuums. 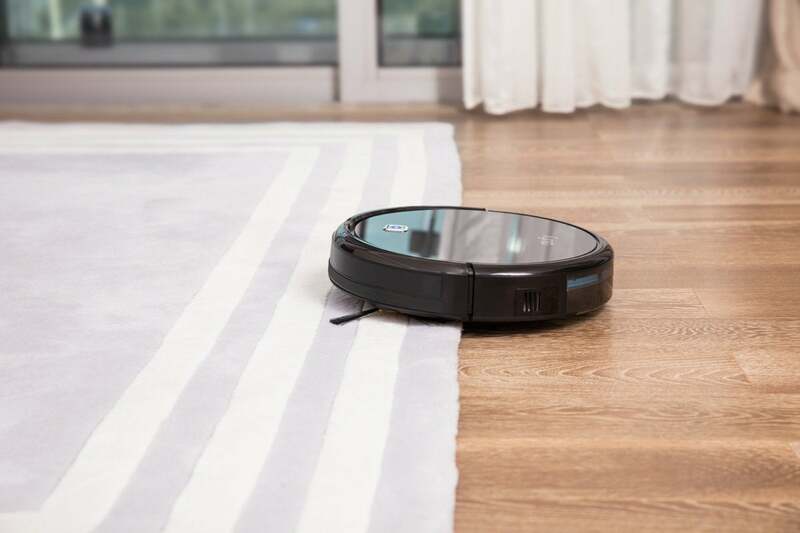 In lieu of a smartphone app, the RobotVac 11 comes with a remote control to direct the vacuum, set various cleaning modes, and schedule cleanings. A charging dock, four attachable side brushes (two are spares), two extra filters, and a cleaning tool are also included. The upside of not having Wi-Fi compatibility is that setting up the RobotVac 11 is a whole lot easier. Just snap on two of the side brushes and turn on the power switch on the vacuum’s side. Then place it on the docking station's charging pins. While the battery is charging, you can get acquainted with the remote control. At the top is a digital display showing the time. You’ll need to set this if you’re going to use the scheduling feature. Beneath the display is a Home button for returning the RobotVac 11 to its dock, an Auto button, a play/pause button, and a directional pad. Six buttons on the bottom let you set the clock; schedule daily cleanings; and select single-room, spot, max suction, or edge cleaning. More on these in a bit. In Edge-cleaning mode, the RoboVac 11 will reduce speed so it can thoroughly clean along walls and baseboards. To perform a general cleaning, you just push the Auto button on top of the vacuum or on the remote. Although, we didn’t actually time it, the RoboVac 11 easily was the fastest out of its dock. There’s was no discernible rhyme or reason to the path it takes across the floor, though; it just bolted from one random point to another, like a toddler chasing something shiny. And like a toddler, it occasionally got into trouble and needed an intervention. Each time I was alerted to a problem when the Auto button on the RoboVac turned red and the vacuum started to beep. This happened a few times during my initial cleaning. In most cases, the RoboVac had just gotten hung up on some object littering the floor, and I was able to free it using the directional pad on the remote. But on one occasion it had actually sucked up a small toy I’d neglected to pick up. I had to turn it over and pry the toy loose from the roller brush. For subsequent cleanings I knew I had to either spend more time prepping the floor than I had with more premium robots, or stay in the room and supervise the cleaning. Turning the RoboVac 11 loose in Auto mode was great for maintenance cleaning,but there are three other modes that came in handy in specific situations. Max Cleaning increases the suction in Auto mode and is great when you just want to vacuum carpets. In Spot mode, the RoboVac cleans in a spiral pattern to remove concentrated dirt. And Edge cleaning reduces the RoboVac’s speed so it can thoroughly clean along walls and baseboards. The RoboVac 11 has one of the flattest profiles of all the robot vacuums we tested, making it great for getting under low-clearance furniture. It’s worth mentioning that the RoboVac has one of the straightest re-docking trajectories we’ve seen. Most robot vacuums will approach their dock, back out, and re-approach from a different angle over and over until they get it right, like a new driver trying to parallel park. The RoboVac 11, however, made a beeline to its dock and parked itself like a pro. The RoboVac 11’s dustbin can hold a fair amount of debris, and I only had to empty it at the end of each cleaning of my 400-foot-square downstairs space. Its hinged top flips open easily so you can dump the contents without risk of spilling it or releasing a cloud of dust into the air. The RoboVac 11 lacks the sexier features of the upscale Roomba and Powerbot models, but it’s unlikely you’ll miss them much once you see how well it cleans your floors. It left carpeting, hardwood, and linoleum immaculate and was able to transition from one floor type to another without a hiccup. 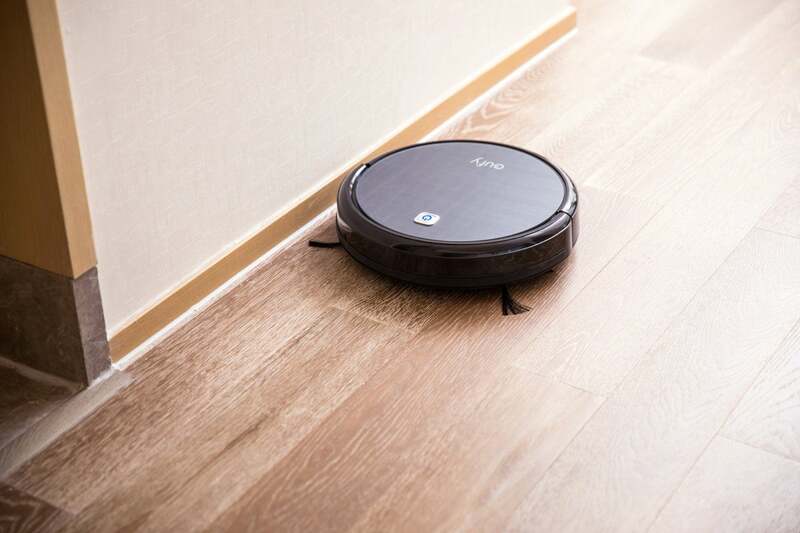 You might need to spend a little more time decluttering your floors for smoother navigation, but it’s well worth it for the value you’ll get from this excellent budget-priced robot. The RobotVac 11 busts dust without busting your budget.